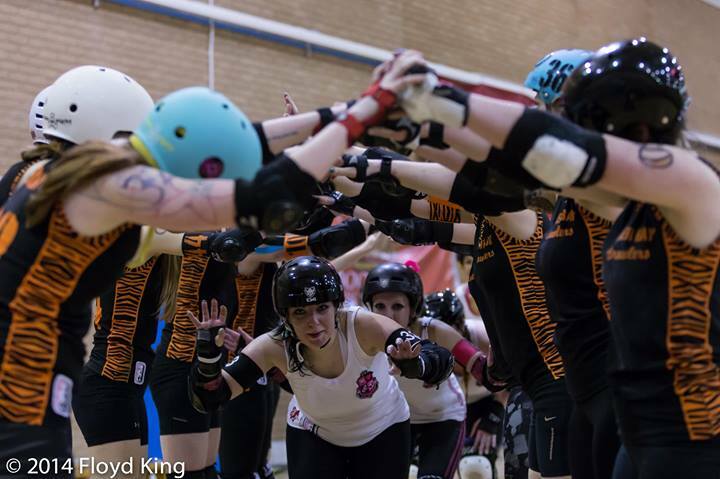 Fresh from their bout against London Brawling, Tiger Bay A looked ready for battle. CCR on the other hand were on the receiving end of what one could only call ‘rotten luck’. With minutes to go, the A-Team were suddenly two players down. 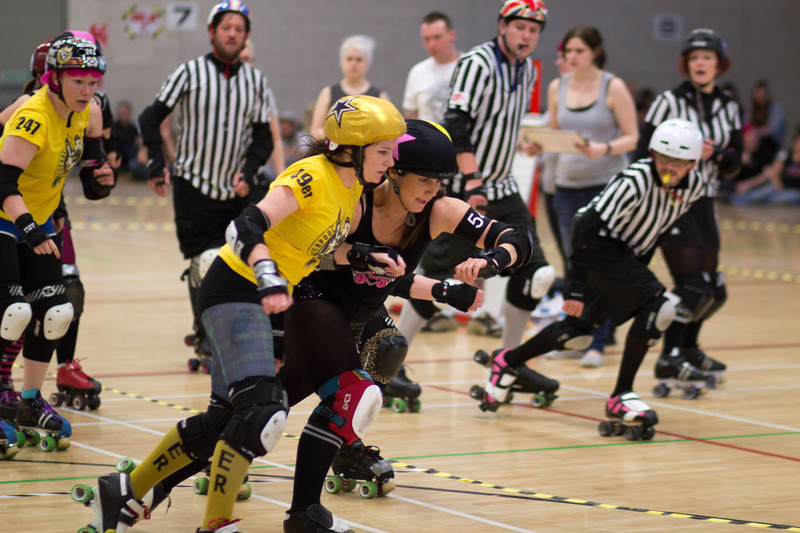 Standing true to the concept that ‘no one player makes a team’, the skaters took to the track undeterred and ready to give Tiger Bay a good game. First whistle and CCR were the first to put points on the board. TBB retaliated, taking the lead in the next jam and notching up an impressive 27 points while CCR’s jammer fought hard to get out the TBB pack. Moments later, CCR were given a power jam dramatically reducing their points deficit – scores were 29 TBB and 24 CCR. It was at this moment the audience realised this wasn’t going to be a walk in the park for TBB – it was going to be one hell of a ride! 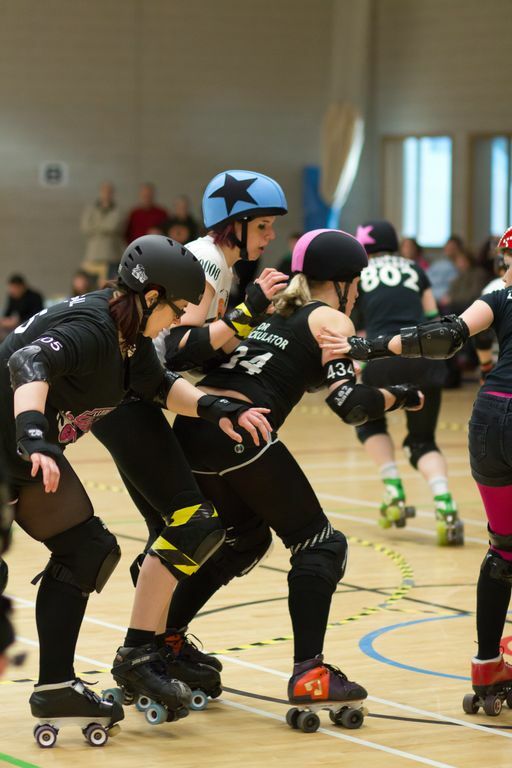 Effective blocking on both teams forced slow packs, with the jammers having to push hard to get out the pack. Once they did, smart pack work would result in recycling of the jammers meaning slow incremental points scoring. 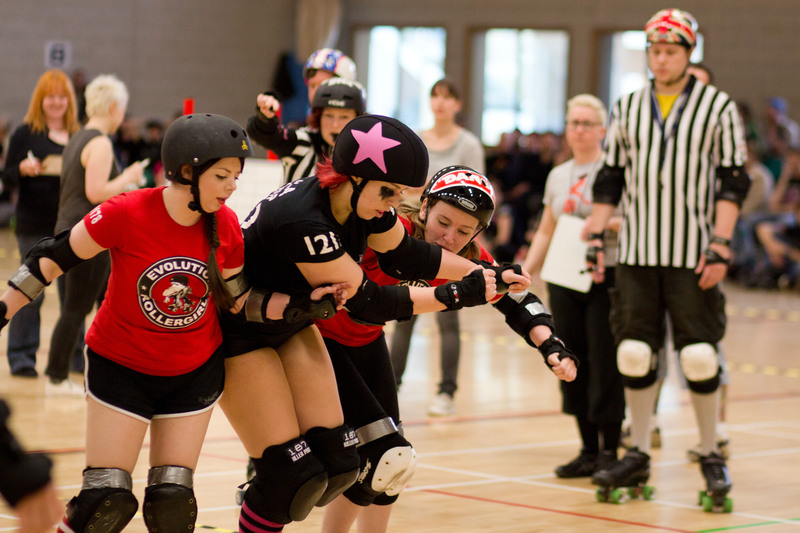 The first 15 minutes of gameplay had TBB leading, but after their jammer took a trip to the box, CCR whipped into the lead with 43 points over TBB 39. Some excellent packwork from CCR and jammer penalties from TBB meant CCR leapt ahead with 71 points whilst TBB stayed at 39 points. The crowd were electric, not knowing whether to breathe as the lead continued to merry go round between the two teams. With three minutes left to go before half time the score was TBB 90 CCR 91 but as half time was called the score settled at Tiger Bay 129 and CCR 99. A few deep breaths and possibly some sort of sedative later we were ready for round 2. CCR’s jammer started in the penalty box, but was swiftly released by TBB’s jammer being called and CCR managed to claw back some much needed points. Both teams were consistent with strong packwork, and sharp tatics. TBB continued to hold the lead, but some great offensive work allowed CCR’s jammers to add points to their score. Midway through and the penalty box was becoming a popular place to be as the hunger grew stronger in both teams. The crowd were treated to aggressive jamming, and solid as a rock blocking. 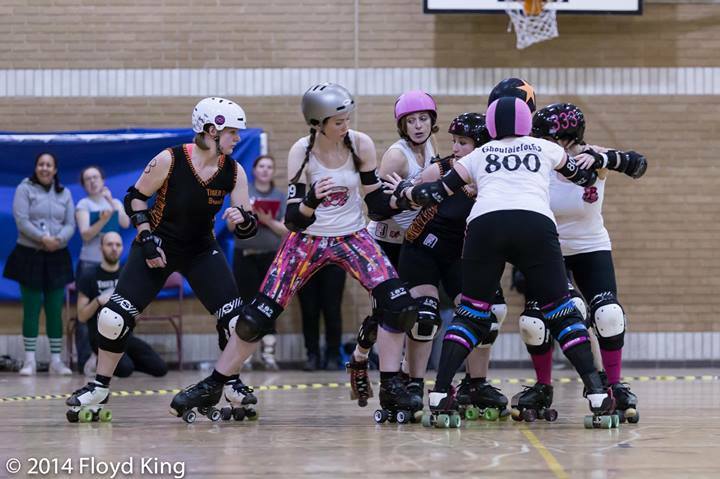 A power jam was awarded to TBB which helped them to increase their lead – TBB162 CCR 118. CCR pulled their walls tighter forcing early call offs and small points increases. With 15 minutes left to go the scores were Tiger Bay 184 to CCR 145. At this point, with 40 points in it, there was still all to play for. As the penalty box was in heavy rotation TBB increased their lead further but CCR keep on fighting. Each team managed to grab a few more points and at final whistle the score was TBB 258 CCR 171. Fantastic play by both sides showed the skill and athleticism that has developed in Derby in recent years. With such a nailbiter of a game, it’s pretty certain that the next time these two teams meet again it’s probably worth having a medical team on standby. The heart can only take so much stress. 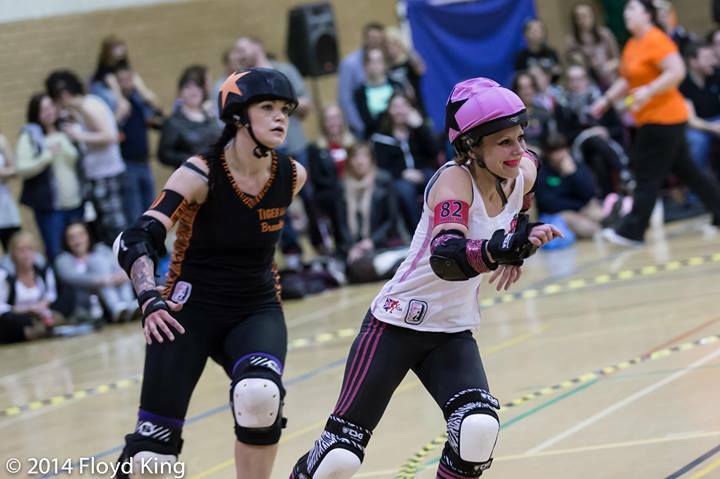 Join us on 29th March to see the A and B Team play Croydon Roller Derby’s A and B Team. Get ticks and info here. And if you’re feeling playful, come join us for our ‘Gamesmaster’ Fundraiser on 6th April at Cherry Reds, Birmingham – more info here. Photo’s courtesy of the amazing Floyd King Photography.